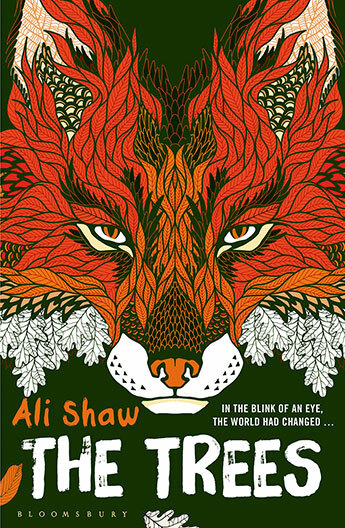 Just when you think you’ve seen (and catalogued) every type of apocalyptic scenario imaginable, along comes Ali Shaw’s The Trees. The treepocalypse that kicks off Shaw’s exploration of man versus nature sees thousands of fully grown trees springing from the earth early one morning, literally ripping modern society apart. Not everyone is upset by this turn of events. As one character thinks, the trees “were as much a promise as they were an apocalypse”. But that doesn’t prevent Shaw from sending his characters on a fairly standard post-apocalyptic journey. It should probably be pointed out that this is not the first treepocalypse of recent times. Doctor Who, a series which in its 50 plus year run has probably dealt with every apocalyptic scenario going, had a similar scenario back in 2014’s “In the Forest of the Night”. Although in that case (spoiler alert), the reason for the trees’ appearance was much more benign and no one died horribly impaled on a branch that emerged suddenly through the middle of their bed in the middle of the night. Shaw’s main character, Alistair, is a bit of a loser. On an indeterminate break from his teaching career, and with his wife away for business in Ireland, Alistair is on a bender on the night the trees come. Despite his hopelessness he ends up being adopted by nature-lover Hannah and her teenage son Seb. They embark on a road journey to find Hannah’s brother and potentially put Alistair on his way to Ireland and find his wife. From here on, The Trees becomes a post- apocalyptic road movie with a few fantasy elements thrown in. The group encounters killers, small self-sufficient communities, crackpot loners and other groups of refugees. Along the way they pick up Hiroko, a prickly Japanese student with handy forest survival skills. Hannah sees strange unicorn-like creatures that she calls Kirin which lead the group on. Alistair meanwhile encounters the whisperers, strange tree-sprites made out of twigs and leaves who keep giving him glimpses of a giant ‘throne tree’. With the help of the whisperers Alistair, grows through the novel to become a sort of hero but not without significant amounts of unexplained supernatural help. The final part of the book is the most clichéd in terms of post-apocalyptic tales. The group find a survivalist colony that has turned its back on the disaster and has fallen under the sway of the charismatic and the violent. But it is also where the narrative picks up significant pace, generating tension by moving away from a gentle drift through the wilderness to embrace real peril. All of Shaw’s books have delved into the fantastic to shine a light on modern life and The Trees is no different. It is just unclear what Shaw is trying to say. There are the obvious debates about man versus nature but they never quite come into focus. And, as in many post-apocalyptic tales, there is an exploration of the true nature of people when civilisation is stripped away. But while it is an interesting experiment, the fantastical elements never quite cohere and The Trees, by falling back on well worn post-apocalyptic tropes, never manages to deliver on its initial promise.